THEY were the final words of Ernesto “Che” Guevara. He uttered them as he was captured by the Bolivian Army in a ravine near La Higuera in Bolivia 50 years ago. Initial reports stated that the Marxist revolutionary died from wounds sustained during a bloody battle that saw the Comandante and his group of 17 guerrillas annihilated by US-backed Bolivian troops. But despite the CIA requesting he be flown to the US for questioning, Che was taken to a nearby schoolhouse and executed the next day, October 9, 1967, aged 39. After he was shot several times by Sergeant, Mario Teran, Che’s hands were cut off as proof of his death while his body was buried in an unmarked grave. It would be another 30 years before Che’s remains were recovered beneath a landing strip in Vallegrande. His body was sent to Cuba and reburied in a ceremony attended by President Fidel Castro and thousands of Cubans. News of the death of Castro’s former right-hand man spread quickly around the world and Che became a counterculture symbol of anti-imperialism, rebellion and revolution. The Argentinian was born Ernesto Rafael Guevara de la Serna in 1928. He qualified as a doctor in 1953, but left Argentina to motorcycle around South America, where he encountered the poverty and oppression of the lower classes. This fuelled his desire to end what he saw as the capitalist exploitation of Latin America by the US. He joined forces with Castro in Mexico in 1956, and was one of 12 survivors of the failed Cuban takeover in the same year. An experienced guerrilla leader, he later helped orchestrate Castro’s “26th of July Movement”, which seized power in Cuba in 1959, toppling US-backed dictator Fulgencio Batista. He rose to become Minister of Industries, but in an effort to spread his revolutionary ideals across Latin America, Che resigned in April, 1965. He resurfaced in Bolivia years later, where his campaign came to its violent end. 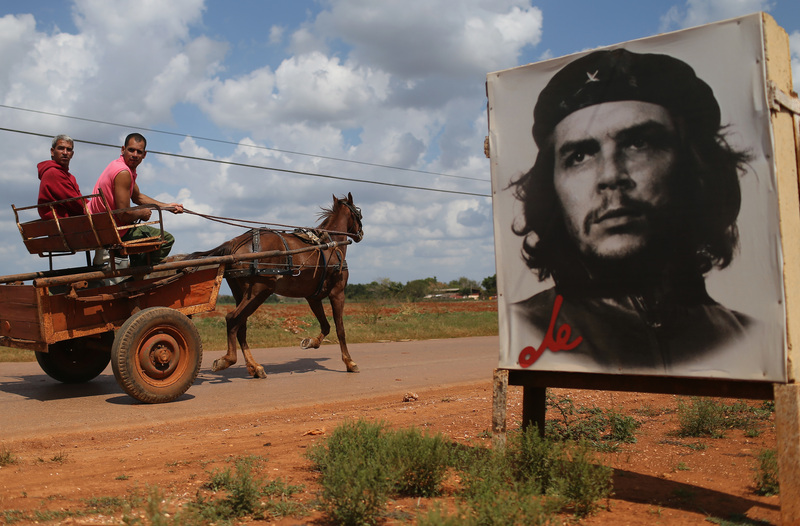 An iconic photo of Che by photographer Alberto Korda has become one of the most-reproduced images of all time. In an ironic twist of fate, his executioner, Teran, was back in the news 40 years later after he had his sight restored by Cuban doctors. He received treatment thanks to a project that offers free eye treatment to poor people across Latin America – something Che would no doubt have welcomed.